Now Accepting Exhibitor Booth Reservations! Largest Independent Insurance Agent and Company Expo in the Midwest! Thank you to our Diamond Partners! 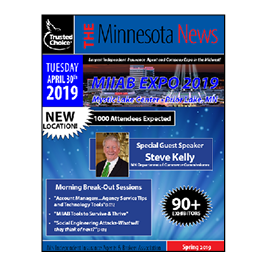 Their support helps to make possible exceptional education opportunities, quality networking events, up-to-date communications to our members and a strong lobbying presence within the state of Minnesota. Gain an unbiased understanding of your agency’s value and make more informed decisions about the future of your business using IntellAgents’ Valuation Services, exclusively developed for independent agencies. Let us be your trusted advisor. We’re here to ensure small- to mid-sized agencies are empowered with the right tools to plan their agency’s perpetuation. Accept credit card and ACH payments online.